InLoox PM helps you make the most of project resources and achieve high quality results. Resource management is a very important part in the overall process of project planning; efficient utilization of the limited project resources is one of the decisive factors when it comes to achieving project goals. With InLoox PM, you have a powerful multi-project resource management software at hands that supports you in making the most of the available project resources. Even better: The software integrates perfectly with Microsoft Outlook, making your resource management easier and faster. At InLoox we believe that a system for project management has to integrate into the daily work routine of every employer. The corporate mission will benefit in full from a software if all team members incorporate the software into their everyday project work. Therefore, two basic principles are paramount in the development of InLoox project software solutions: high user acceptance and strong user-friendliness. 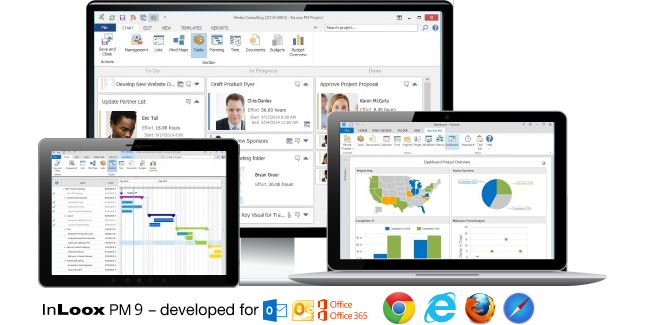 InLoox PM integrates perfectly with Microsoft Outlook, a program that your team already uses every day in their work routine. The new software naturally becomes part of the existing work infrastructure instead of adding yet another software that only causes overhead. Thanks to the integrated technology, existing information like Outlook calendar entries, e-mail communication and Outlook task lists are availble in the project management program. InLoox PM technology is based on Microsoft Outlook navigation, making it very easy to grasp the software's functionality. With minimal need for on the software training everyone on the team is more productive from day one. 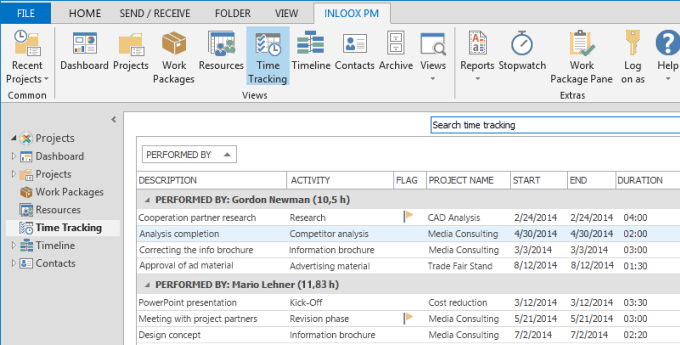 We compiled information below on the various resource management features included in InLoox PM for Outlook that help you make the most of the resources you have at hand to achieve high quality project results. 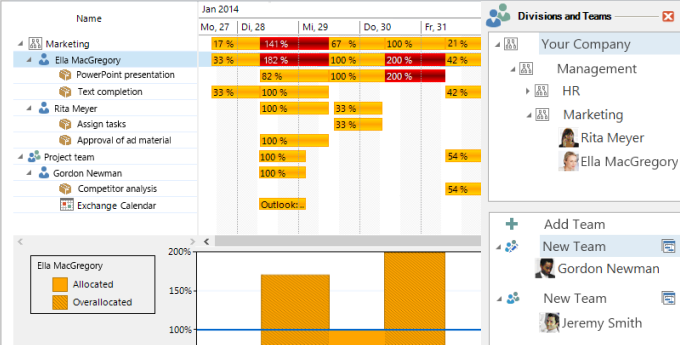 InLoox PM provides a real-time up-to-date overview of your resource capacities and utilization. The software automatically calculates the total capacity of your teams and departments based on the customizable working hour calanders that you can adjust to reflect the working hours in your company. 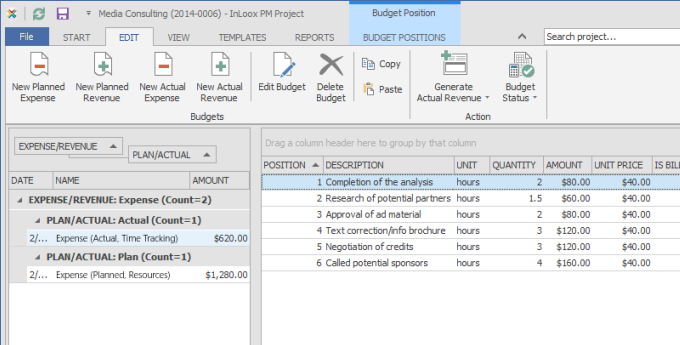 This offers more planning security for your project schedule. The software shows you which resources have potentially too much work on their desk helping you to re-assign tasks and efficiently achieve a balanced workload across your entire project team. Define work groups and departments and monitor their real-time workload. On a group level, you can see how the workload and spare capacities are distributed across teams and departments. If you find that the workload is distributed unevenly in your team, you can re-assign tasks to a different project member at the click of a button. Not only does the software support you in maintaining a balanced workload for everyone involved. InLoox PM also supports you in finding the right person on your team for the right job. 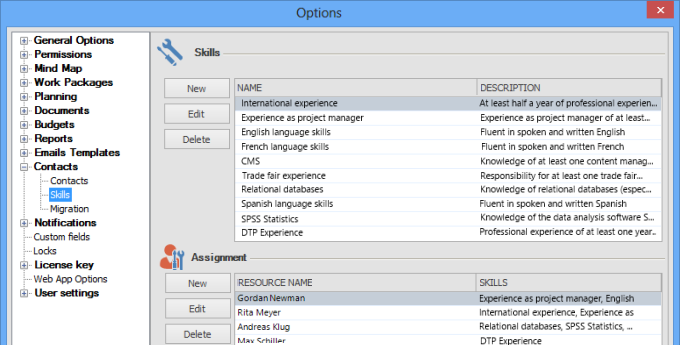 Add information on a team member's special expertise and skills and match them to the requirements of the project task. 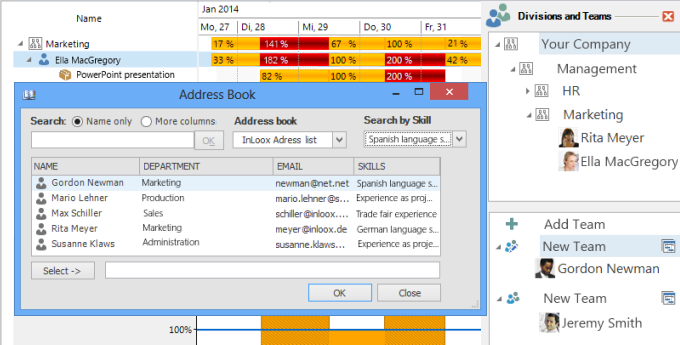 Thanks to the Outlook integration you also have the employer's contact information at hand, making company wide communication more efficient. InLoox makes it extremely easy for every team member to stay self organized. With the integrated stop watch and time tracking feature, everyone can record the time they spent on the completion of the task and save the time record in the respective project files. The software automatically calculates all project resource related costs. You can enter custom fixed cost rates into InLoox PM and use them in every new project you start. The software calculates the project specific costs according to the cost center and activity for which they incur. Project managers can enter additional and unexpected costs at any point to reflect the actual costs for the projects resource management. The software helps you keep track of the development of project related costs by providing a continuous plan/actual comparison. Make the most of your resources and position your projects for success! Discover how InLoox helps you optimize your resource management. Resource Management with InLoox PM for Outlook • Copyright 1999-2019 © InLoox, Inc. All rights reserved.